The intricate web of ownership meant this acquisition rumor made shares of Delek US Holdings, Alon USA Energy, and CVR Refining soar in August. 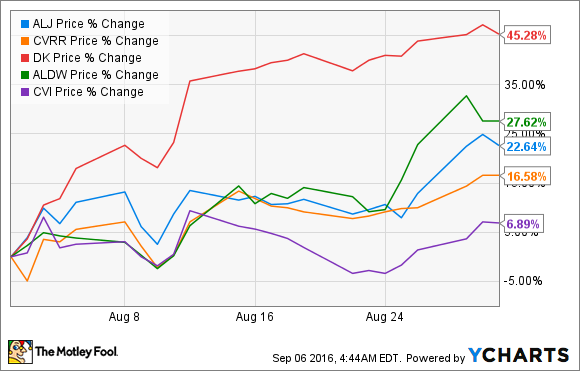 Shares of Delek US Holdings (NYSE:DK), Alon USA Energy (NYSE:ALJ), and CVR Refining (NYSE:CVRR) all saw big jumps in August. The big primer for this stock price change came on Aug. 11 when a rumor surfaced that CVR Energy (NYSE:CVI) was looking to buy Delek. The news also sent shares of Alon USA Partners (NYSE:ALDW) up more than 10%, as well. It might seem a bit odd that all three of these companies' shares moved considerably when the announcement involved only two companies. That is, until you consider how all of these companies are pretty intimately connected. The first thing to realize is that Delek US Holdings owns 48% of all shares outstanding in Alon USA Energy. Alon USA Partners is the master limited partnership of Alon USA Energy, which owns 81% of all shares outstanding. On the other side of the deal, CVR Refining is the subsidiary master limited partnership of CVR Energy, which owns and operates CVR's refining operations. In the event that CVR Energy were to acquire Delek, chances are very likely that Delek's refining assets would then be dropped down into CVR Refining and combined into a single operation. Conversely, with a 48% stake in Alon already, it's not too much of a stretch to see the company consolidate those holdings as well into a single refining unit. This would be a pretty significant change in the refining industry in the U.S. Today Alon, Delek, and CVR Refining have 147,000, 155,000, and 185,000 barrels per day of refining capacity, respectively. That doesn't include the additional 70,000 barrels per day of refining capacity owned by Alon in California that haven't been operational since 2012. Assuming that Alon is added to the mix, this would immediately vault the combined company to the nation's sixth largest independent refiner and would significantly consolidate three of the smaller players in the business. It should also be noted that CVR Refining has a reputation for efficient and low-cost operations, something that Delek and Alon could use, considering the strategic locations of their refineries. It's far too soon to say whether this deal goes through or not, and investors who are pinning their hopes on the deal shouldn't necessarily hold their breath. One thing we have learned this year about mergers and acquisitions in the energy industry is that no deal is certain until the ink is dry. So investors shouldn't be too hasty and pin their investment thesis on this deal alone. If -- I can't overstate enough the word "if" -- this deal does go through, though, it could help make the combined companies much larger players in the refining industry. CVR Refining's management could do great things with Delek and Alon's refining assets, as well as their logistics assets. It may take several quarters before we realize those benefits, but it would certainly be something worth looking forward to if the deal were to go through.